A Battle Of Guitar Tonewoods: Can You Hear The Difference? 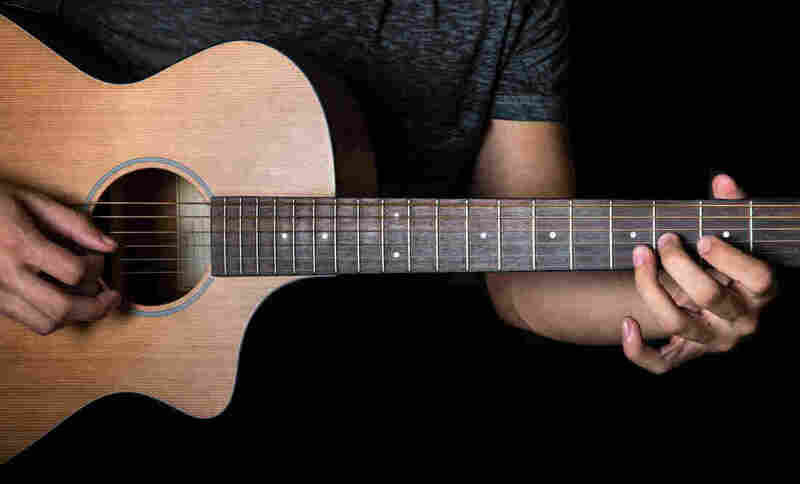 An NPR sound engineer evaluated the difference in sound between Mahogany and Rosewood guitars. See if you can tell the two instruments apart. A lot factors come into play in creating a guitar's sound.There's size and shape of the instrument and its parts. Then, there's the skill and the approach of the musician to consider. What do you hear when someone strums a guitar? You might describe the sound as bright, or full, or warm. Maybe it's metallic or trebly, or maybe it's something else. All of that is, of course, pretty subjective. In more objective terms, we can talk about the sonic signature of the instrument. To capture that signature, we did a spectrum analysis. That's a visualization of how the low, bass tones relate to the middle tones that are like the human voice, as well as the higher-pitched tones. We plotted the analysis here, generating a spectrogram. Our visualization isn't scientific. We're looking at sound gathered by pointing a directional microphone at two guitars. The opportunity to do that came from Robert Benincasa's visit to the Martin Guitar company factory to write about the effect of rosewood trade regulations on the music industry. A lot factors come into play in creating a guitar's sound. There's size and shape of the instrument and its parts. Then, there's the skill and the approach of the musician to consider. The type, age and humidity of the woods that make up the guitar are some of the most important factors. Josh Parker, an engineer with the C.F. Martin Company of Nazereth, Pa., is playing a mahogany-based Martin D-18 and a rosewood based Martin D-28. As Parker put it, "Tone is totally subjective, so we don't like to speak good versus bad – just different." Listen for yourself below, and follow how the spectrogram changes throughout the sound clips. The orange squiggles in the lower third of the graphs represent low tones, the middle third represents midrange tones, and the top third represents high tones. You can see the actual frequencies along the vertical scale on the right side of the graph. The brighter the orange data is, the louder that tone, or frequency, is at that moment. Strong frequencies appear as more-solid horizontal lines in the graph. The differences in our graphs are very subtle. In the first example, the mahogany guitar, you may see brighter yellow horizontal lines that appear slightly lower on the graph than in the second example, the rosewood guitar. This could mean that the first guitar has slightly more energy in the low tones (100 – 200Hz) which may be interpreted as sounding fuller. In contrast, the middle of the second graph has a slightly higher concentration of yellow horizontal lines in the midrange frequencies (500 -900Hz). This may result in the rosewood guitar sounding a bit more vocal, or less full than the mahogany one. The data in the top third of each graph is very similar, indicating both guitars exhibit similar brightness. As to which guitar sounds better, that's a matter of taste. Kevin Wait is a sound engineer and technology strategist at NPR.